Thousands of Peruvian have held a rally to demand that ex-President Alberto Fujimori be extradited from Chile. The rally came as the Supreme Court rejected the first extradition bid. 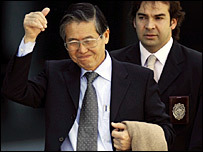 It had sought Mr Fujimori's extradition for abandoning his post, but the judges ruled this was not a major criminal offence in Chile. Mr Fujimori was arrested in Chile after arriving from self-imposed exile in Japan. He faces a number of charges in Peru, but denies any wrongdoing. Peru's government is expected to file new extradition requests. On Tuesday, Mr Fujimori lost a second legal attempt to be released from detention in Santiago. A request presented by an anonymous Chilean citizen had earlier claimed there were irregularities in the ex-president's detention and that it was illegal. 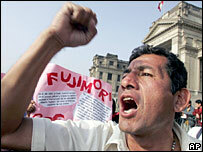 Mr Fujimori, who was president from 1990 to 2000, faces a long jail sentence if sent back to Peru. He has vowed to run for the Peruvian presidency next April despite being barred from holding public office until 2010. The ex-president, 67, has Japanese and Peruvian nationality. Tokyo has vowed to defend the rights of Mr Fujimori and has called on the Chilean government to treat him fairly. Japanese embassy officials have visited him to check on his health. Mr Fujimori - whose parents were originally from Japan - fled to Japan in 2000. Tokyo has repeatedly turned down requests from Lima for his extradition.